County cricket: Yorkshire beat Lancashire, Somerset v Worcs and more – live! Big wicket for Middlesex. James Harris has just trapped Sam Hain lbw for 37, ending a 44-run stand with Tim Ambrose (unbeaten 19). They had taken Warwickshire to 108-5 in pursuit of 203, but Middlesex now only need four wickets at Lord’s to topple the Division Two leaders. Jeetan Patel in now. Azhar Ali is within three runs of a debut century for Somerset against Worcestershire at New Road, with the visitors in command at 300-7 in their second innings, leading by 380. Moeen Ali has four wickets, including the 300th of his first-class career. 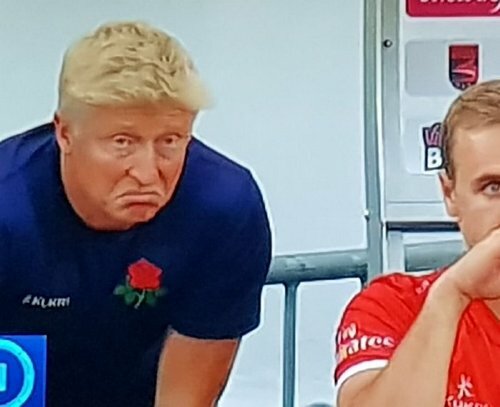 After a lengthy squad meeting in the Old Trafford dressing room, which went on for well over an hour, Lancashire coach Glen Chapple has reacted to his side’s Roses defeat. He said: “It’s been a strange game. I think the first innings Yorkshire were 120 for seven or so, and they ended up getting too many from our perspective. Their tail put on 70 odd, and it was a good effort. “We were in a similar position and weren’t able to do that, so conceded a big first-innings lead. From there, I thought we fought hard. “We were playing well in this second innings and, given a reasonable amount of luck, we would have done better. We’ve been unlucky. We’ve had three fairly poor umpiring decisions that have affected us badly. “Of course (we are in a relegation battle). It would be crazy not to understand that. We said from the start of the season that Division One has strong teams throughout. “Results haven’t gone our way. The challenge is to win games to get us to a place of safety and see how far we can climb the table. Surrey have won by an innings and 183 runs, bowling Notts out for 199 in their second innings. That is their sixth win from eight games, five on the trot and four of those by an innings. Morne Morkel finishes with 5-60 in the second innings of a maximum points win and 9-120 in the match. They currently have a 43-point lead at the top, which will be cut if Somerset beat Worcestershire. Even then, I’m not sure whether they can be caught. I presume you saw the tweets, instigated by Reece Topley of all people, comparing Glen Chapple to Donald Trump following a photo taken during their T20 win at Leicestershire last week. They didn’t half make me laugh, and we are wondering whether to ask the Lancashire coach when he comes up to do media in a bit whether he can make Lancashire great again. At Chesterfield, Wayne Madsen is closing in on his second hundred of the season for Derbyshire, who have the upper hand against Northamptonshire. They are 253-5 in their second innings, leading by 224. Madsen is unbeaten on 93. Moving up to Division One, Pakistan batsman Azhar Ali (46) is closing in on a debut fifty for Somerset against Worcestershire at New Road. They are 189-4, leading by 269. Notts are tumbling towards defeat against Surrey. Having started day three at 57-1 in their second innings, trailing by 325, they have slipped to 172-7 at lunch. Morne Morkel has claimed four of them, including Samit Patel, Billy Root and Stuart Broad (lbw for one) today. At New Road, Somerset are 181-3 in their second innings against Worcestershire, a lead of 261. In Division Two, Warwickshire are in early trouble pursuing 203 to beat Middlesex at Lord’s. The leaders have slipped to 10-2, including Ian Bell bowled by Tim Murtagh, who has also removed Dom Sibley. Rhodes and Trott at the crease. A further line from Old Trafford.Lancashire have been deducted a point due to a slow over-rate, so only take two from this match instead of the three they accrued. It could have been a lot worse for them as they were minus four on the board at one stage. Some reaction from Yorkshire coach Andrew Gale to their Roses win. “That’s an awesome win,” he said. “To come here and take the points is a fantastic effort. It was a very up and down game which kept you on the edge of your seat and a great spectacle for county cricket. “To get bowled out for 190 with the batting line-up we had, a hat-trick, I thought we were 100 short of where we wanted to be on that pitch. But to come out and bowl in the fashion we did, it got us back in the game. “The partnership between Brooky and Jonny was fantastic (second innings), and the tail wagged and got us in a great position. We knew if we bowled in the right areas for a period of time, we’d get our rewards. Elsewhere, it looks like a cracker of a finish at Lord’s, between Middlesex and Division Two leaders Warwickshire. Middlesex are 239-8 in their second innings, leading by 199. From afar, I’d probably just favour Warwickshire, but there has not been a score of 300 in the match so far, so I may be wrong. Yorkshire have won. A 19-point haul comes with their third win from eight matches this season and consigns Lancashire to a fifth defeat in nine. They are in big trouble at the bottom of the Division One table. Joe Root claimed three of four wickets to fall this morning; Graham Onions caught behind, Matthew Parkinson caught at slip and Jimmy Anderson bowled. Liam Livingstone came out to bat one-handed, but he didn’t face a ball. Lancashire are out for 204, a victory margin of 118. Meanwhile, Notts are two down in their second innings against Surrey at Trent Bridge, with Sam Curran trapping Steven Mullaney lbw. The hosts are 85-2. Lancashire are seven down, and it’s Joe Root again – with the first ball of the day. He forces Graham Onions to push forward and feather behind to Jonny Bairstow. That was Root’s second wicket in three balls after getting Jos Buttler last night. The Red Rose have since moved to 195-7 courtesy of a Matthew Parkinson single. Little else to report from around the grounds so far. Good morning from a sunny Old Trafford, where Yorkshire have Lancashire on the rack ahead of day three. We are two results down across the country in this round of Championship fixtures, with the promise of more to follow today. Both those results have come in Division Two. Sussex beat Glamorgan inside two days under the Hove lights yesterday and Leicestershire beat Kent at Canterbury. Those two results have changed the picture in the promotion race, with Jason Gillespie’s Sussex (121 points after eight games) into the top two at the expense of Kent (115 points after eight). Leicestershire are very much in hunt too (111 from eight). Elsewhere in Division Two, Middlesex and Warwickshire at Lord’s and Derbyshire versus Northamptonshire at Chesterfield could also finish today. Middlesex, having conceded a 40-run lead on first innings, are 183-6 second time around, including four wickets for Bears off-spinner Jeetan Patel. What an overseas player he has been across the years! Ollie Rayner and John Simpson are in the early stages of their innings. At Queen’s Park, Derbyshire are 147-4 in their second innings, leading by 118. That could be a cracking finish between two sides with little to play for in terms of league position. Rounding off Division Two, Durham are 219-5 in reply to Gloucestershire’s 362 all out at Cheltenham. Tom Latham is unbeaten on 120 following encouraging signs with the ball for England’s Ben Stokes, who claimed five wickets on days one and two. Back to Division One. This game at Old Trafford will definitely finish today unless we get a Manchester monsoon, and it will more than likely finish well before the sandwiches are laid out in the press box. Lancashire, chasing 323, are 194-6 with no recognised batsman left aside from Liam Livingstone, who has a fractured left thumb and has his arm in a cast as a result. The noises from the Lancashire dressing room are that Livingstone will bat, but only if it gets down what is widely known as squeaky bum time. The wicket of Jos Buttler in the penultimate over last night, caught at leg slip sweeping at Joe Root, was a real killer for the hosts. Buttler was going nicely on 59, but he was tempted into playing at one that pitched outside leg from around the wicket and paid the price, even if replays suggest he was unfortunate to be given out. Mind you, he wasn’t the only one who can say that. Alex Davies, Jordan Clark and Gary Ballance all have strong cases. This will be a massive win for Yorkshire to give themselves breathing space in the relegation battle. Lancashire will be in the mire having only won one of nine matches. Nottinghamshire have it all to do to avoid an innings defeat against leaders Surrey at Trent Bridge. They will resume on 57-1 in their second innings, trailing by 325. Surrey currently have that momentum which carried Essex to the title last year. At New Road, Somerset are 127 ahead of bottom side Worcestershire at 47-0 in their second innings. Good work from Jamie Overton and Josh Davey with the ball yesterday – four wickets apiece – as the hosts were bowled out for 257 in reply to 357.